Online Success Plan, found at mysuccessplanonline.com guarantees you $500 for watching their short sales video. Can they be trusted? More importantly, is Online Success Plan a scam? Let’s find out in this Online Success Plan review. Will you really get the promised $500 payout? 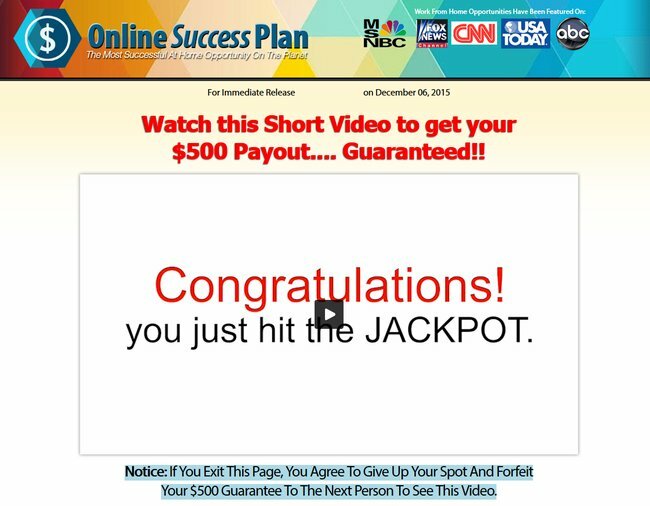 Online Success Plan by Jordan Daniels makes a bold claim right when you enter the homepage. You are guaranteed a $500 payout just by watching their sales video. Are you really going to get $500? Not really. We’ll walk you through the entire Online Success Plan scam in this review, and let you know what are the red flags you should watch out for. Firstly, before anything else, you should be wary when an unknown website makes a seemingly outrageous claim that doesn’t make sense. Why would anyone pay you $500 just to watch a video? The sole purpose of the headline is to get you excited for their sales video. When you watch their video with excitement and in anticipation of a good payout, this is where they try to brainwash you. In the sales video, Online Success Plan keeps repeating how their system will make you so much money that you don’t have to work anymore. Once you sign up with them, you will gain access to their “Millionaire Website” that is ready to make you money. Their system will normally cost $15,000, but since you “got lucky” and came across the sales page, it is all yours for $97, just to cover the website maintenance costs. Sorry to burst your bubble, but as someone who earns money from the internet, I can assure you there is no “ready-made system” that brings in cash for you everyday. And if the system is really valued at $15,000, why would Jordan Daniels gives it away to a stranger at $97? The sales video is full of empty promises and unsubstantiated hypes. There’s no concrete information on how their “Millionaire Website” works, or how the money will be generated. If something seems too good to be true, it most probably is. Contrary to what Online Success Plan promises you in their videos and sales materials, they are denying any sort of income claims and guarantees in their hidden earnings disclaimer. Which means their $500 guaranteed payout is a blatant lie, too. You won’t see this document unless you scroll to the bottom of their page, click on their “earnings disclaimer” and read through the fine prints. In the disclaimer, Online Success Plan also denies doing any hypes, despite the outrageous promises of $500 guaranteed payout and “automated Millionaire Website” in their sales materials. However, there is one thing that I agree with the disclaimer within Online Success Plan. To be successful in online business, you have to commit to a legitimate business model and work on it consistently. Unfortunately, Online Success Plan just isn’t one of them. With Online Success Plan, you are expected to provide your credit card details and make a payment of $97 before you even understand what their system is all about. A legitimate online business doesn’t operate this way. You should be able to try the opportunity for free before you make an informed decision and commit to a payment. At the payment page, if you attempt to close the window, a pop-up will appear, giving you an instant $20 discount. If the system is really as good as Jordan claims, why would he sell a $15,000 system at $97, and then give another $20 discount when you decide to pass it on? Jordan Daniels just wants you to buy the system so he can rip you off in the members section. I’ve come across similar scams before, and like Online Success Plan, becoming a member is just the first step of getting ripped off. Once you are a member, you will be required to purchase many more up-sells to “make the system work”, which will add up to a substantial monthly expense. Stay away from Online Success Plan scam. The answer is pretty clear. YES, THIS IS A SCAM! Hi George, if you want to build a legitimate online business try Wealthy Affiliate. It will take some time to build it up and start seeing cashflow, but it will be a business that you own for yourself. Don’t buy into anything that promises easy money, those are most likely scams that are designed to rip you off. Hoopla, I’ve worked my whole life except 3 times for a couple of months to have my 3 babies. Now I’m retired but barely making it. Getting a “work from home” job is perfect for me now that I have medical problems. So you see to some of us this is a “real job”. One that is perfect for us at this time in our lives. Has this worked for you? I’m needing to find help with an online job! Please help!! Hi Travis, online success plan doesn’t work, its a scam. If you want something that works try Wealthy Affiliate. I’m wondering how they got a full news story from kgun9 about their “millionaire website.” That’s what almost sold me on it before I decided to do more checking around. Not just gonna randomly hand out my credit card details for I have no idea what. Their video explained literally nothing other than saying you’d make tons of money. Hi Justin, I was in a similar situation before and I got scammed a lot. There are still legitimate platforms online, you just have to find and test them. One of the best places you can learn online marketing will be at http://www.wealthyaffiliate.com. You can sign up for the starter account for free. May I ask, what kind of site are you trying to build sir? Hi Aray, you should check the transaction history on your card and see if there are other suspicious transactions apart from the initial payment. Call up your bank to stop payments to the suspicious recipient if there is any. Aray I have plenty of internet savvy and I still fell to a phishing scam last year via Western Union. During a moment when I was busy I didn’t have much patience but I am still a believer and also polite. I got scammed. I now realize that there are people who don’t believe and don’t hold the same moral ethics as I have. Put a hold on your bank card and get a new card. Dun Cole PS, thanks for your input. The program I recommend is free to get started, so there’s nothing to lose except for the time invested to watch the training videos and to understand how it works. Hi Fred, a sales video that make you buy something you don’t understand isn’t really the same as 10 training videos packed full with contents that teach you how to build an online business. I’ll prefer if you actually sign up for a free account and see for yourself. Hi Brandon, it’s a program teaching you how to build websites and online businesses. You can think of it as a training program. Don’t buy into programs that claim to work and make you money (such as binary options robots). Those are most likely scams. If you want to make money online you have to learn and put in the effort, just like in any other businesses. Sorry that I can’t reply in Spanish as I don’t speak the language. I’ve translated using Google translate and roughly know what you mean. If you want a legitimate program you can try Wealthy Affiliate, but the content is in English. It’s free to get started don’t worry to give it a try. Yes I have been scammed a lot. I was sent this as a fix all. I would love to find something legit but I am not sure it exist. I know how you feel, I’ve been scammed alot in the past too. Give Wealthy Affiliate a try, it’s one of the best legit platforms out there. Hello Cristie Lee What actually works is ‘hard work’. Actually it’s smart-work if you know your business. Thanks a lot Sir. I really appreciate your help. I was almost brainwashed. Thanks once again. You’re welcome Hamza, stay safe! Wow I almost fell for it wow are you serious!!! I’ve been scammed before and I’m not about to go down that road again these people prey on people nation wide who they think is so desperate enough to fall for their get rich quick scheme. Thank God I did my research. Stay away from them REFUSE REFUSE !!! I was one of the gullible ones and input my credit card info. It said that there was a problem processing my payment and we I know all of the info was correct. Now I’m wondering if there is a chance that they are going to steal my credit card info!! You’ll most likely receive calls from their broker sales team to make you fund the account, but firmly refuse them. Also, keep an eye on your account balance for the next few weeks to make sure there are no unauthorized deductions. Hi Steve, thanks for the comment. It’s always crucial to do some research if it involves payment. Hi Islam, how can I help you? I was like how could it be possible . I knew it , it should be fake. I checked it out but didn’t fall for it .. Thanks for the info. I think these type of ‘scams’ should be reports as out and out FRAUDS! So many of them on the internet….from face creams that promise you will look like the 20 yr old model to these type of scams… earn money at home on your computer. If people started suing these companies perhaps a lot will go out of business knowing there are CONSEQUENCES at the end. Hi Juleon, don’t pay for any more upsells you see in the members section. They’ll continue to rip you off by saying you have to buy add ons for it to work, but it won’t.